Even when they’re not in the same room at the same time – in this particular instance, connected together through the magic of conference calls – there’s a special bond that’s developed between singer-songwriters Josh Pyke and Kevin Mitchell (AKA Bob Evans) that’s all too apparent. They appear to be inextricably on one another’s wavelength, joking around and shooting the breeze to the point where it doesn’t even feel like an interview. Mitchell, for one, is on a tangent about his love of podcasts. He recently started up one of his own, entitled Good Evans, It’s a Bobcast, and finds the medium to be completely fascinating. With ‘Marty’ out of the picture, it’s time to talk origin stories. Before Pyke and Mitchell head out on an extensive national jaunt to celebrate a decade of their friendship, it’s worth remembering that Mitchell’s original band, Perth veterans Jebediah played a big part in Pyke’s own coming of age. “I remember it really vividly,” he says. “I was driving home from rehearsals with my old punk band, long before I ever did anything solo. I was listening to the radio and this song comes on…” At this point, Pyke defers directly to Mitchell. “That’s Jerks of Attention,” replies Mitchell, who’s no doubt gotten used to serving as a human Shazam of sorts in regards to his own songs getting sung back to him over the years. In the decade since, Mitchell has become equally as renowned for his Bob Evans music as that of Jebediah; while Pyke has released several critically-acclaimed LPs and toured extensively through both capital and regional Australia. For all they’ve achieved on their own accord, however, they’ve made sure to never lose touch – in fact, theirs is a bond that has survived on both mutual respect and a vast common ground. The tour comes as Pyke is wrapping up promotion for his 2015 album, But for All These Shrinking Hearts; while Mitchell spruiks his LP from earlier this year, Car Boot Sale, which is his fifth under the Bob Evans moniker. 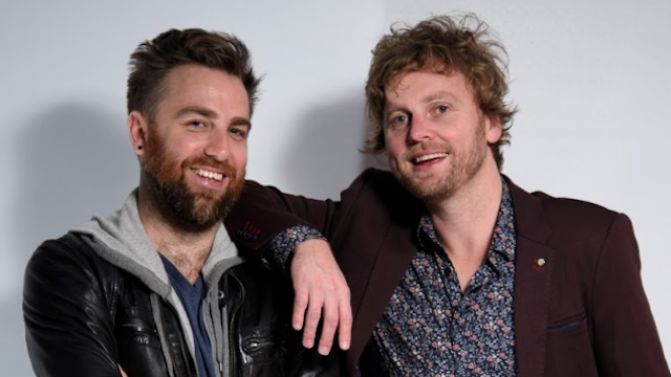 Although it may seem as though the tour is being presented as a co-headliner, the reality is that Bob Evans & Josh Pyke is intended to be singular – as in, you’re getting a combined set in duo mode from them. “When we first toured together, it was very separate – I played a set, he played a set and then we collaborated on a couple of songs at the end,” explains Pyke. Tickets for Another Evening With Josh Pyke and Bob Evans are currently on sale, tickets are available via Josh Pyke Website / Bob Evans Website. Full details below.